A major US oil company relies on the FLUXUS flow meters for liquid applications on its gas exploration sites. Pulsating low flows on high-pressure liquids in small diameter, thick walled pipes (schedule160) were the primary challenges for the FLUXUS flow meters. Because of high sour gas content, a continuous control of the injection rate of ethylamine into the risers to avoid sulphur crystallisation is crucial. The extracted gas later becomes dehydrated in absorber towers using triethylene glycol. Precise low flow measurement is important to maintain the glycol volume flow in exact ratio with the gas volume flow. FLUXUS was the answer the company had been searching for: The employed FLUXUS XLF non-invasive low flow meter captures the ethylamine as well as the glycol flows accurately and reliably. A of its high measuring cycles (measurement readings every 10ms), even pulsating flows are precisly monitored. Due to the fact, that the measuring system is installed on the pipe wall outside, the extreme pressures inside aren't a challenge. Process shut-downs for installation or maintenance belong to the past. 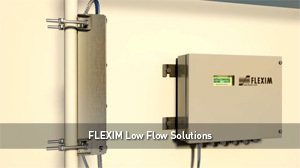 To date, the company has installed more than 100 FLEXIM flow meters, which have given eight years of uninterrupted service.